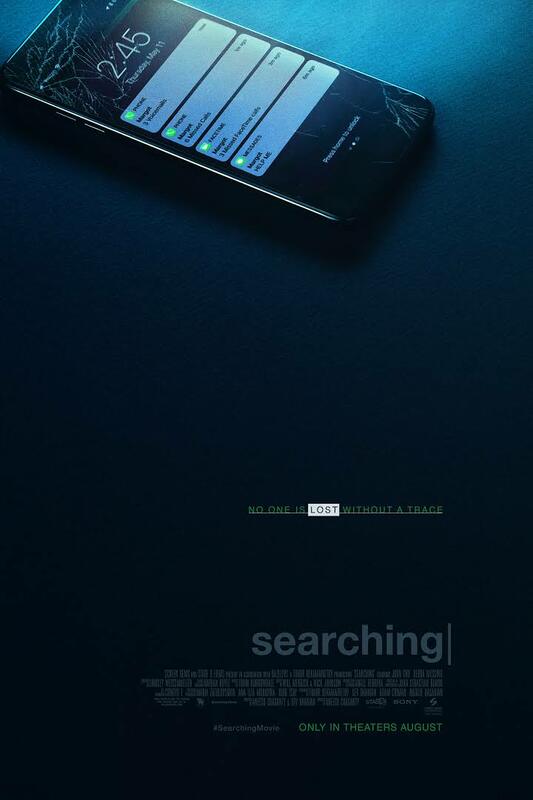 "Satisfying Police Thriller for Social Media Geeks"
SEARCHING is a thriller about a man trying to find his missing teenage daughter by going through her Internet and social media footprint. Using computer video, emails, and phone messages to tell its story, SEARCHING stays nimble enough to keep viewers glued to their seats, and has a positive father-daughter theme, but there’s foul language, violence, and implied marijuana use. SEARCHING is a thriller about a man looking for his missing teenage daughter by going through her Internet and social media footprint. Using computer video and messaging to tell its story, SEARCHING stays nimble enough to keep viewers glued to their seats and has a positive father-daughter theme, but there’s some foul language, violence and implied marijuana use. SEARCHING begins with a long vignette from various social media sources displayed on screen introducing the Kim family. David Kim (John Cho) is a forties something dad. Pam Nam Kim (Sarah Sohn) is his wife, and Margot (Michelle La) is their cute daughter. The family is shown through various stages of life in an assortment of homemade videos and photos. The brief timeline documents Pam’s cancer diagnosis and the progression of her illness, which sadly culminates in her death. Cut to present day. Mom is gone. Margot is now a normal teenager going to school, studying piano and doing all the things teenagers do. Dad is a widower who tries to be a good single father to his daughter, but is a little short in the sensitivity department, mixing parental love with an authoritarian touch. Nevertheless, father and daughter seem to get along fairly well until the fateful day when Margot announces over the phone that she’s going to stay out late to study with some of her school friends. Unfortunately, that evening David is dead tired and fast asleep when Margot calls home. The next morning David gets up but doesn’t notice anything out of the ordinary and thinks Margot already left for school. However, as the day progresses, and he doesn’t hear from her, he begins to get concerned. He tries to contact Margot, but she doesn’t return his calls, emails, or online messages. At that point, David becomes worried something may not be right. He then calls his brother Peter (Joseph Lee), who occasionally does things together with Margot. However, Peter hasn’t heard from her either, nor does he have any idea what she may doing. David then starts an online search looking for clues to Margot’s disappearance, trying to establish who her closest school friends are and who may have seen her last. However, he can’t get into some of Margot’s accounts, because they’re password protected. After hitting a number of dead ends, and as more precious time goes by without any results, David files a missing persons report with the police. Detective Rosemary Vick (Debra Messing) returns David’s call, but she makes the troubled dad even more of an alarmed wreck than he already is, when she explains that statistics show more people remain missing indefinitely than are ever found. However, she assures David she’ll do everything possible to find his daughter. She then gives David a set of instructions to help her expand the search for Margot and improve their chances of finding her. Det. Vick then tells him that she understands what he’s going through because she happens to have a son whom she would do anything for as well. Despite Vick’s assurances, David isn’t satisfied waiting for developments without playing an active role in the search himself. So, he starts pouring through social media while Detective Vick at her end uses various methods to access Margot’s protected accounts and search for more clues in her computer and phone. Later, David joins the search party around the area where Margot may have been before she disappeared. Eventually, it becomes obvious that his eagerness to help may actually be impeding Detective Vick’s efforts after David gets into an ugly fist fight in public with one of Margot’s school friends while trying to extract information from the boy. At this point, Vick has had enough and shuts out David from any further participation in the investigation. Of course, when it comes to trying to find a missing daughter using a police force that only seems to be going through the motions, giving up efforts to figure out what happened to one’s daughter is the last thing in this father’s mind. So, David continues his own investigation online. As a debilitating weariness begins to set in because of the dead ends and false leads David keeps uncovering, his dogged determination finally rewards him with some mindblowing, surprising discoveries. Revelation after revelation surprises the audience and keeps viewers engaged all the way to the movie’s unexpected end. After the previous experiment to tell a story solely via computer screens made its debut in UNFRIENDED, SEARCHING takes a fresh stab at it. This time, the filmmakers deftly mix standard movie storytelling with blinking cursors, emails, phone messages, and Internet video to tell their story. An added bonus is the fact that the story comes filled with enough twists and turns to make anyone’s head spin. Although the end result is still not totally successful, it’s certainly better than the previous one. That’s because SEARCHING is equipped with a clever, more emotionally involving script. In UNFRIENDED, all the Internet and computer messaging came across as more of a gimmick. Here, however, Director Aneesh Chaganty presents a fairly believable work with solid production values and a good cast. That said, Debra Messing’s performance as the personally troubled, occasionally forlorn Detective Vick sometimes comes across as too melodramatic, while Joseph Lee’s performance as David’s brother Peter is only adequate. John Cho as David, however, drives the plot forward with his intensity. Also, his dialogue, whether in person or as a piece of text on a computer screen, reveals the pain and frustration of a widower who’s still grieving while finding his role as a single father difficult to perform. Consequently, his performance rises above the standard level for the thriller genre. Director Chaganty should be commended for keeping the violence to a minimum. There are only a couple scenes that go beyond fisticuffs. Finally, there’s some implied marijuana use by a couple characters, but it’s not promoted. The glue that binds the scenes together in SEARCHING is family. There’s the loving mother who eventually dies. There’s the love between David and his daughter, Margot. Finally, there’s the love that Detective Vick displays for her own son. Even when wrongly applied, the movie’s scenes of family love show that love is the most important value of all. Ultimately, SEARCHING delivers a compelling police thriller, with an appealing pro-family theme, but extreme caution is advised for the movie’s violence, foul language (including the f-word) and implied marijuana use. Some lying, plus dishonest choices with criminal consequences by some characters. SEARCHING is a thriller about a man searching for his missing teenage daughter by going through her Internet and social media footprint. A touching prologue introduces David and his daughter, Margot, who are grieving over the tragic natural death of Margot’s mother. One night, Margot calls to say she’ll be out late studying with friends, but David’s asleep when she calls. The next day, he realizes she never came home and starts searching for her. Working with a female detective who handles missing persons cases, David’s search finally rewards him with some surprising but unsettling discoveries. SEARCHING mixes standard movie storytelling with blinking cursors, emails, phone messages, and Internet video to tell its story. It deftly moves the story forward rather than draws attention to its computer effects like other movies. The end result is a well-crafted police thriller that doesn’t break any barriers but provides some good popcorn entertainment. SEARCHING has no overt Christian elements, but scenes of family love promote love as the most important value of all. Extreme caution is advised for some violence, foul language and implied marijuana use. Starring: John Cho, Debra Messing, Joseph Lee, Michelle La, Sarah Sohn. Director: Director Chaganty should be commended for keeping the violence to a minimum. There are only a couple scenes that go beyond fisticuffs. Finally, there’s some implied marijuana use by a couple characters, but it’s not promoted.